In case of a pesticide spill, follow the “Three C’s” – control, contain, and clean up. Control the spill immediately to prevent further spillage. Contain the spill by diking the spill with absorbent material or sorbent pads to keep it out of water and prevent environmental contamination. Clean up the spill. Use absorbent material to soak up the spill, then shovel contaminated material into a plastic storage container for disposal. Refer to the PES Spill section for more information. Call 911, the State Patrol, or the emergency response telephone number if listed on shipping papers. Give as much information as you can safely. Your name, and telephone number. Location and nature of problem. Name and identification number of material(s) involved. Vehicle description and license number. Type and size of container(s). Local conditions, including weather conditions and proximity to hospitals, schools, and bodies of water. You may be required to call the state environmental agency if surface water may be contaminated by the spill. Call 911, give the location of the fire, and explain that pesticides are involved. Call a nearby hospital so they can be prepared to treat the injured for pesticide exposure. Send a list of the pesticides (copy of the shipping document) involved in the accident to the hospital with the injured. Where possible, start first aid but avoid contact with the pesticides. Wear gloves to move victims to a pesticide-free area. Immediately remove clothing contaminated with pesticides and warn others of the danger. Do not try to extinguish the fire without adequate protective clothing and respiratory protection. 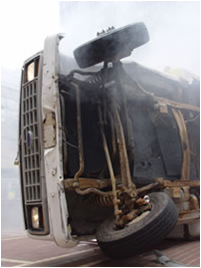 Keep all people upwind of the accident and if there is a fire, evacuate nearby buildings. Avoid breathing smoke, fumes, vapors, or dusts. At a minimum, wear rubber boots and gloves. Avoid using large amounts of water to extinguish a fire to keep toxic runoff to a minimum. For liquids, control runoff with dikes using equipment from your spill kit. Block routes to sewer lines and storm runoff inlets so the runoff can be recovered and environmental contamination kept to a minimum. Cover powdered pesticides with a tarp to prevent movement of toxic dust by winds or passing vehicles. To protect yourself follow these personal precautions and encourage others to do the same. As soon as possible, wash and shower using large amounts of soap and water to remove all toxic chemicals. Pay special attention to the scalp, fingernails, all skins folds, ears, nose, and eyes. Watch for early symptoms of pesticide poisoning such as headache, dizziness, nausea, sweating, or blurred vision. These symptoms may show up immediately or after several hours.